Once upon a time, this site was simply a place for me to blog about my new purchases. Over time, it has become so much more, and I couldn’t be happier. It’s been so busy doing all the great new stuff that AFB has become, however, that I haven’t posted a review for ages! While we now review multiple toys every week on our podcast, there is something very enjoyable about getting out the camera and writing down my thoughts about a new acquisition, so I am going to try to get back into the habit and use this space to highlight some items that won’t get full reviews on the show. 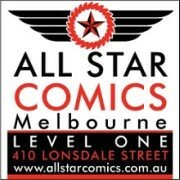 Who knows, you might see the other AFB hosts posting reviews here as well! 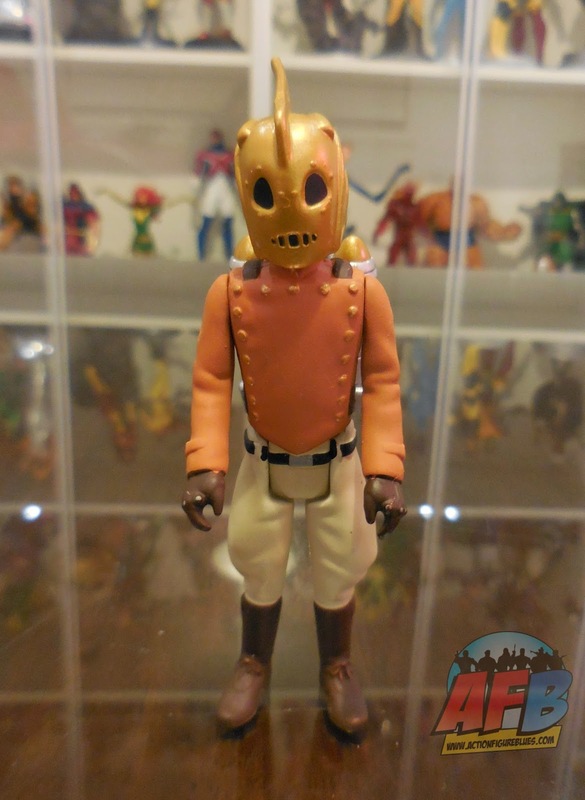 Tonight I’m checking out something quite interesting – the Funko ReAction The Rocketeer 3 ¾ Figure. Funko has burst on to the collectibles scene and has progressed from pop vinyl to action figures, which has the potential to be very exciting. 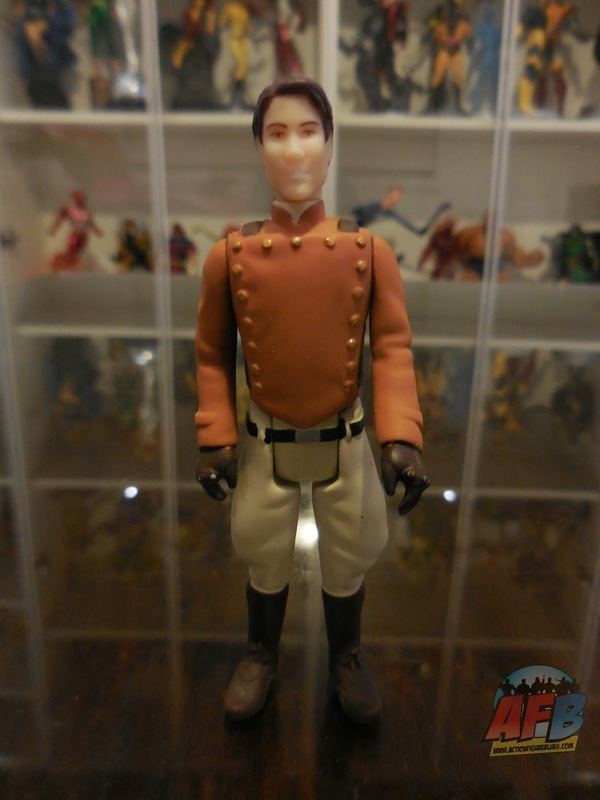 It’s certainly great to have more players in this game, and the idea of the ReAction Figures is something that really appeals to me – toys that harken back to the carded 3 ¾” figures and “rack toys” of old. For something to be effectively retro in my eyes, it needs to harken back to something old without being slavish to it, and I’m not certain that’s been achieved here. What would really elevate this line for me would be a more collector-friendly packaging design. The retro carded feel is great – but totally destroyed if you want to open the figure. A design that allowed you to inspect the figure and then display either loose or on card would be something I could see myself attracted to. That’s really reinforced once you open this toy. It’s cute, but very basic. Simple five points of articulation and with (mostly) acceptable detail and accessories. 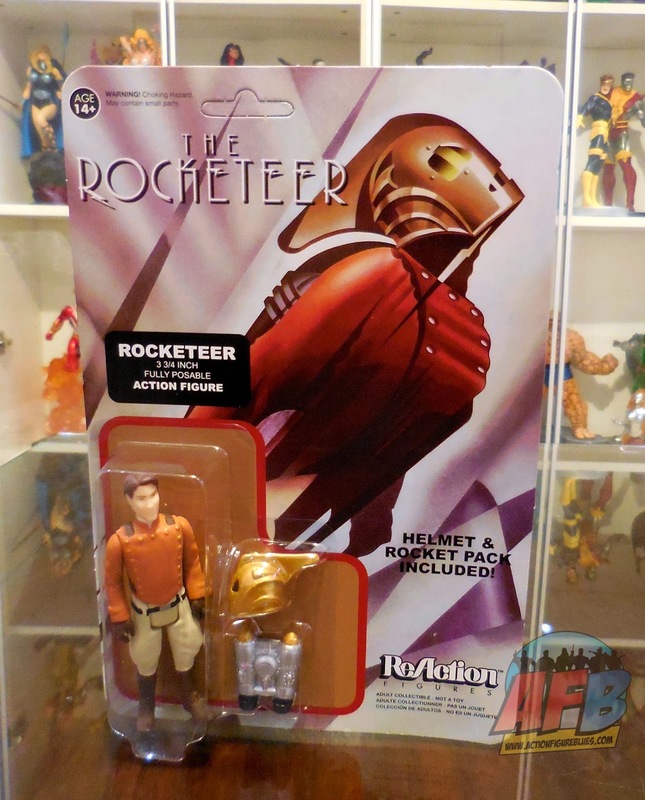 Sculpt-wise, there is some very nice detail here, particularly in the Rocketeer’s uniform and his two accessories – his helmet and jet pack. 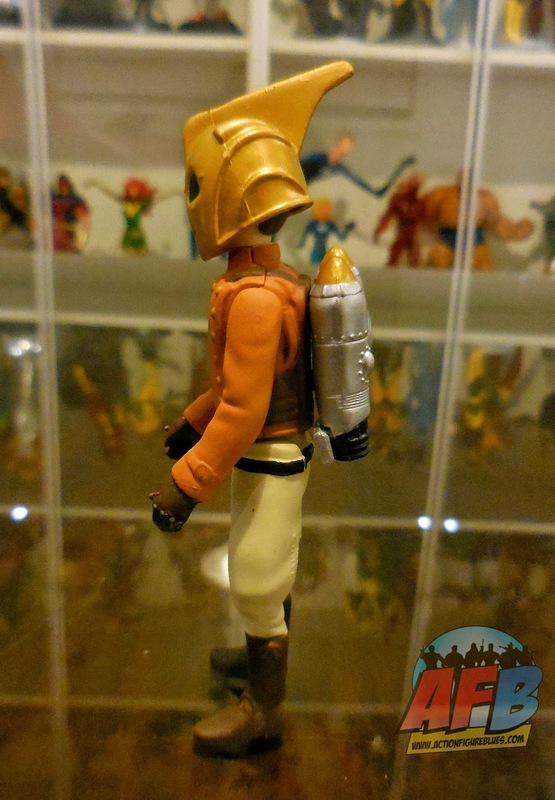 He stands easily and while the addition of the jetpack requires some rebalancing, it is still easy to find his balance. Funko’s Pop Vinyl line has been plagued by spotty QC when it comes to paint, and there are issues here too – brown spots on his cream trousers and a few areas of bleed. 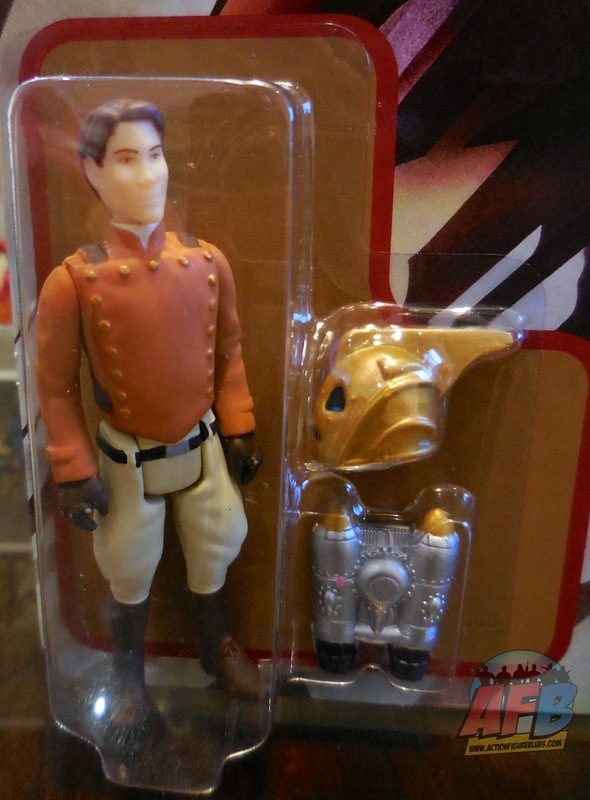 Especially disappointing is The Rocketeer’s face, which is really lacking in definition and looks sort of sprayed on rather than painted. Sadly, I pretty much regretted opening this as soon as I did, because it’s an idea that’s better appreciated in theory than in reality. 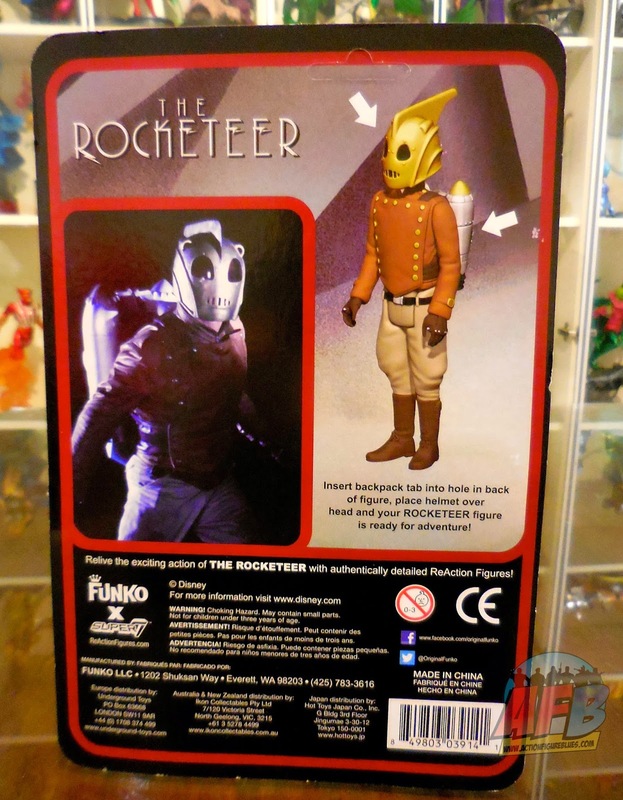 This really comes home once you put on the Rocketeer’s helmet, and the toy instantly becomes a kid dressed up as The Rocketeer for Halloween with a much-too-big helmet on his oversized head. There’s just not enough going for this figure to make it something I’d want to display loose. Funko has hit on a model that relies on the love of particular licenses and nostalgia to sell product, but I am not sure I see this concept reaching the popularity of the Pop Vinyls. 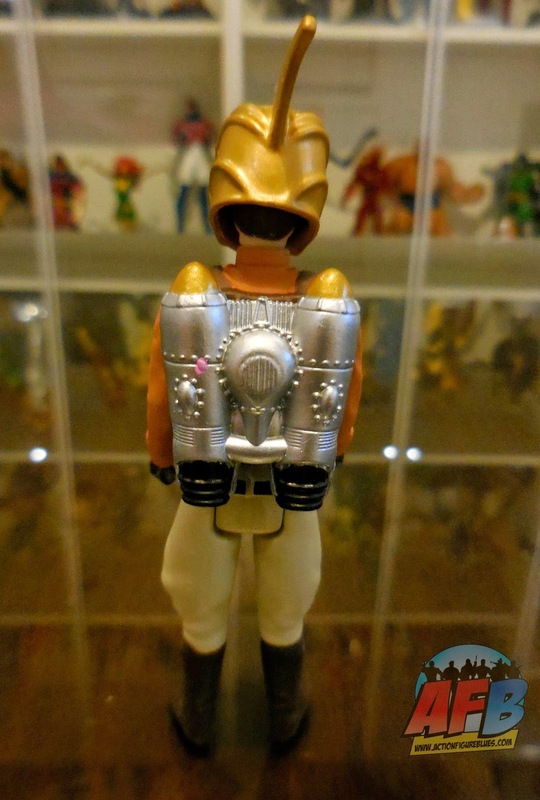 Again, I think that collectors would probably respond to this idea if there was an aspect of the product that elevated it beyond a reproduction style rack toy to a retro “feel” modern figure – a re-openable package or a higher degree of detail in face sculpts, for example. For a Dolly Rating (now the standard scale of rating toys on the AFB Podcast), I can’t go higher than a 6, and most of that is for the concept rather than the execution. I’m left underwhelmed on too many fronts to go higher. If you’d like to see a full set of photos of this item, please check out the album on Flickr. 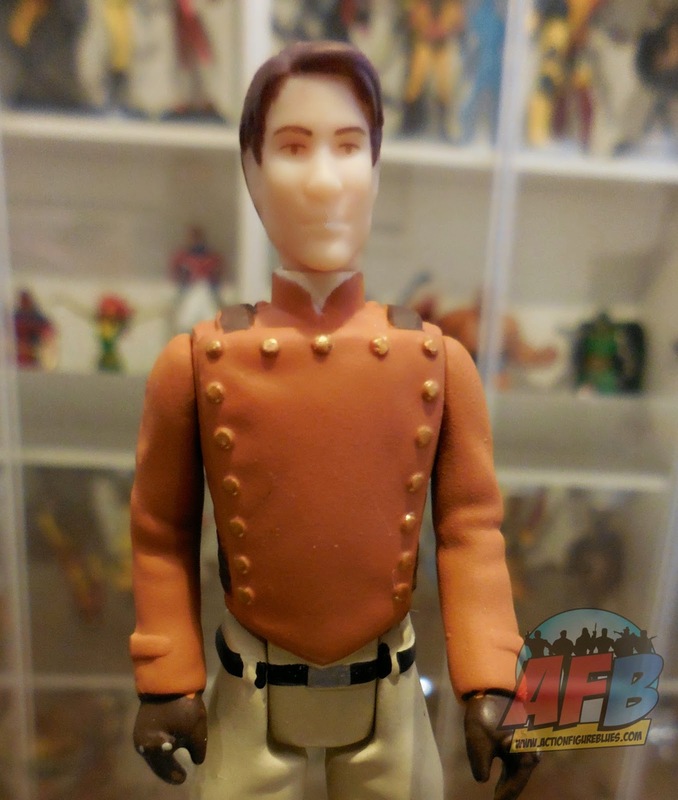 Your thoughts about this item are most welcome – please comment here or over at the AFB Facebook Page! He borrowed his Dad's helmet.